I've posted a link to our December newsletter on the lower left of this page. 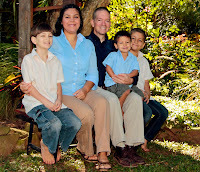 We've been in Santa Cruz, Bolivia, since the 27th of November, visiting with Lizet's family. The boys have been having a wonderful time with their tías (aunts) and their abuelito and abuelita. We came for Twana's graduation from high school, which was on the 4th, but decided to stay a couple of weeks. It's been a very pleasant, relaxing time. I wasn't going to bring my laptop, but at the last minute I decided I would. On the whole, it's been a good thing. I've still gotten plenty of rest, had nice times with the family, and enjoyed playing with the boys. But I've also managed to get caught up on lots of things and been able to stay in touch so that I don't anticipate having to dig through a mountain of emails when I get home to Paraguay on Tuesday!